The head medicine spirit of this tree is a giant. It helps to recover from emotional shocks and release past traumas. 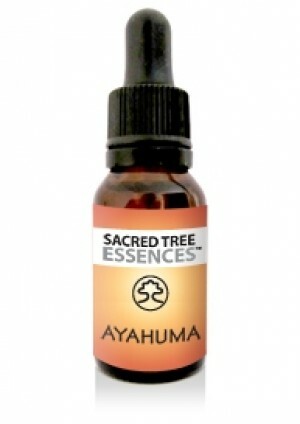 The essence enables us to connect to the strength, support and protection of the Ayahuma tree. The colour of this tree's energetic medicine is orange, representing its beautiful and therapeutic flowers. This colour is warm and revitalising. The head medicine spirit of this tree is a grandfather spirit who wields a spiritual staff of strength and protection. This essence is used to bring peace and tranquillity by calming the heart and mind. The colour of Bobinsana's energetic medicine is deep pink, representing the tree's beautiful and therapeutic flowers. This colour is vibrant and nurturing. This essence is made from the seeds of the camalonga tree. It is a teacher plant that works in the dream time. Connect to this tree to stimulate lucid and vivid dreaming. The colour of Camalonga's energetic medicine is light blue, representative of sky, water, spaciousness and expansiveness. This colour is cool and calm. Capirona has a very light energy that can brighten dark moods. Connect to this tree to help combat negative energies from other people or the environment. The essence can make your energetic body slippery, like the bark of this tree, so that negative energies slide off. The colour of Capirona's energetic medicine is lime green, representing the tree's distinctive bark. This colour is refreshing and invigorating. The head medicine spirits are doctor spirits, who work on re-aligning the energetic centres of the body. The colour of this essence's energetic medicine is red, representing physical life force and vitality. This colour is energising and vibrant. The energy of this tree is light and uplifting. Connect with this tree to open your heart centre and bring a sense of happiness and well-being. The colour of Cumaceba's energetic medicine is pink, symbolising love and the inner child. This colour is gentle and playful. This tree's energy is light and airy. Connect to this essence to bring freshness to the mind, clearing negative thought loops. The colour of Huaira Caspi's energetic medicine is green, representing the tree's ability to balance the heart and mind. This colour is peaceful and relaxing. Lupuna is one of the biggest trees in the Amazon. It stands tall and proud. Connect to this tree to bring you strength, courage, expansion and self-esteem. Its energy is light and very grounding. The colour of this essence's energetic medicine is turquoise, representing the expansion of Lupuna from the earth, reaching the skies. This colour is calm, serene and uplifting. The head medicine spirit of this tree is a yellow anaconda. The snake’s energy is agile and perceptive. This essence can be used for extracting negative energies from the body. Connect to this tree for cleansing and protection. The colour of Punga's energetic medicine is yellow, representative of this tree's name and the snake’s markings. This colour is inspiring and illuminating. The head medicine spirits of this tree are native warriors. This essence helps to move dense negative energies and break cyclical patterns of behaviour, as well as allowing us to connect to our personal power and inner strength. The colour of Remo Caspi's energetic medicine is a deep red, representing the tree’s earthy and grounding nature. This colour is rich and nourishing. This tree is used to transmute negative energies. Connect to this essence to move through obstacles and transform. The colour of Shiwawaku's energetic medicine is purple, representing psychic intuition and transformation. This colour is spiritual and creative. The head medicine spirit is a giant land tortoise. This essence can help those who lead a fast paced lifestyle to find balance in their lives, keeping them centred, calm and productive. The colour of Tortuga's energetic medicine is bronze, symbolising the protective nature of the tortoise shell. This colour is unifying and earthy. The head medicine spirit is Abuelo Sanango, a grandfather spirit. This tree provides energetic protection in the form of steel armour. Connect to this tree for inner truth, clarity and spiritual development. The colour of this essence's energetic medicine is magenta, representing mysticism and spirituality. This colour is vitalising and optimistic. The head medicine spirit is a black jaguar that removes blocked energies from the body. The jaguar’s energy is fearless, focused and determined. Connect with this tree for purification, inner security and confidence. The colour of Una de Gato's energetic medicine is indigo blue, representing the jaguar's regalness. This colour is intense and electric.